1. Mr. T. Venkataraman, Managing Director, Goodrich Maritime Pvt. Ltd. Thanks for your encouraging praise ! Having participated in two previous editions in Kolkata I felt that this year's programme was indeed a crowning glory. First of all it was a full house. A very knowledgeable crowd who sincerely enjoyed every bit of the Panel Discussion on an interesting topic "Paradigm shift in Cargo and Logistics in the East Coast". A topic which was so exciting as unlike previous years a lot of positive things have happened all over the Eastern Region and the normally despondent note changed to one of gaiety and hope. The Awards function also had its own excitement as usual with participants wholeheartedly cheering each winner. All of us now have got used to EXIM's superlative quality at such events. Thank you very much for the follow-up action. Thanks for the invite to a grand and knowledge sharing programme, as always very well organised. 4. Mr. Parthasarathy Gopalan, Area General Manager – South & East India, CMA CGM Agencies (India) Pvt. Ltd. The event was fantastically organised. It was my pleasure to be a part of this event which I enjoyed thoroughly. Taking this opportunity I must thank you and EXIM Publication for organising this sort of event which ensures perfect networking opportunity, resulting in more closer entity of the stakeholders at large besides encouraging the top performers in their respective field. Our sincere thanks for considering a part of this event. 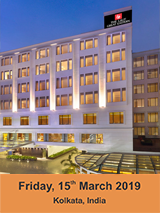 Thank you for the excellent arrangements made on the successful conduct of the ECMF 2019 at Kolkata. It was a privilege and honour for us to be part of the event. We appreciate the professional management of the entire event which was well attended by relevant stakeholders. 9. Mr. Dhritiman Mookherjee, JMD, EMU Lines Pvt. 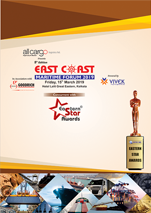 Ltd.
We would like to thank you for organising the 5th East Coast Maritime Forum along with the Eastern Star Awards 2019 on 15th March 2019 so well ,that it helps the Shipping Fraternity to get bonded more strongly in the coming times. The topics chosen for the discussion were apt and had immense depth which are beneficial for all who attended it. The panelists , the judges and all involved were high ranked professionals and it goes without saying that we all gained a lot interacting with them. We wish you and all in The Shipping Times more success in all future events. 10. Dr. Piyush Kanti Acharya, Managing Director, North Sea Shipping & Logistics Pvt. Ltd. I personally feel honoured & privileged.